When you’re ready to get rid of capitalism, gender oppression and white supremacy, what do you do? How do we make revolution? Well, the first thing to know is you can’t do it alone. It takes massive numbers of working class and oppressed people. So how do we start building? Some revolutionary organizing builds a base of counter-power outside the system, by meeting oppressed people’s needs independently. This can start small, like with a garden in a vacant lot to grow vegetables for a neighborhood dealing with poverty. It can be daring and life-saving, like the Jane Collective in Chicago in the early 70s, feminists who learned to perform safe abortions before they were legal. And it can build until it’s strong enough to challenge the state—a goal revolutionaries call dual power. 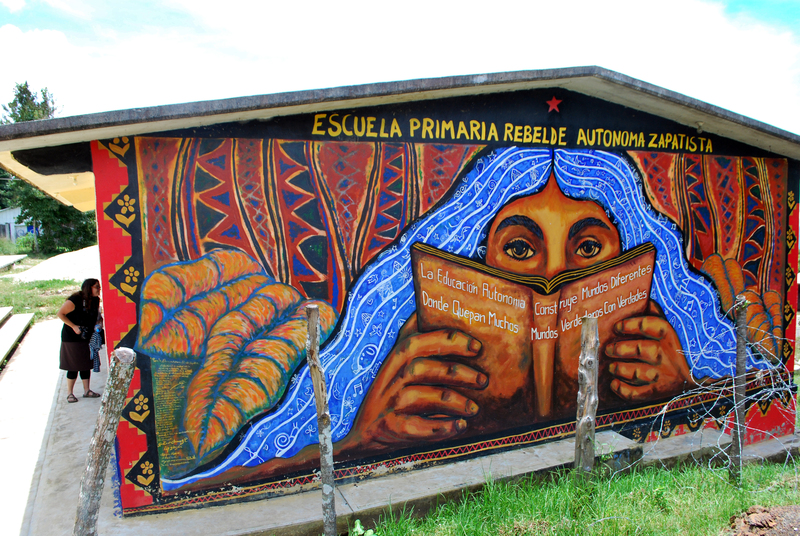 In Zapatista communities, indigenous people run their own free society with schools, farming, water systems, and health centers, where the Mexican government is no longer in charge. While building counter-power, we also have to fight the state—we can’t just ignore it and hope it’ll go away. By “the state,” I’m not talking about Pennsylvania, but the institutions the ruling class uses to stay in power, like the government, military and police. We’re not strong enough yet to smash the state or take state power in order to end capitalism and all the other -isms. But there are ways to win things we can use to build our power, so we can get strong enough to make revolution. This is where reform struggles come in. We can demand immediate improvements in our lives that the state, landlords, and corporations can make happen because they have power over us. The danger is, it becomes tempting to just hope politicians and such will fix things, instead of imagining a world where the ruling class doesn’t have power over us—and creating a strategy to fight for that world. Sometimes grassroots activists move into government positions, nonprofit leadership or public speaking roles that separate them from their community. Poor and working class movements can be co-opted and become reformist, only demanding reforms that don’t challenge the state or capitalism. Instead, we have to build our collective power outside of and against the system. Movements win reforms by using our social power. Politicians answer to big business nearly 100% of the time, but when working class and oppressed people organize a strong enough base, we can make them answer to us instead. This is because politicians are only in power over us due to the fact that we allow them to be. It’s our job to fight them until we can get strong enough to take their power back. The Repeal Coalition in Arizona, for example, fights for reforms that actually take power away from the state. Their motto is, “Fight for the Freedom to Live, Love, and Work anywhere you please! Repeal ALL anti-immigrant legislation NOW!” Like the feminist demand to repeal all laws related to abortion, this demand stakes a claim for oppressed people to have autonomy over our own bodies and survival. It makes clear that the government is doing more harm than good, instead of demanding more laws. This clarity makes it easier to build a base of revolutionary struggle among people impacted by the laws. It’s no surprise that the Repeal Coalition was started by Bring the Ruckus, a revolutionary organization that built toward a dual power strategy. Philadelphia anti-prison organizer Layne Mullett criticizes reformist demands in her article, “Brick by Brick: Creating a World Without Prisons,” published by the Institute for Anarchist Studies. She observes, “Many anti-death penalty organizations are supporters of Life Without Parole (LWOP) sentencing, based on the idea that people will only accept an end to the death penalty if LWOP is a sentencing option.” But this demand just gives power to the state by keeping people in prison the rest of their lives. If you want to abolish prisons entirely, you need to make demands that are a step toward abolition. “In Decarcerate PA, we talk a lot about using language that is ‘abolition compatible,’” Mullett writes. Decarcerate PA is an all-volunteer group that includes organizers who used to be in prison. So when they get people released, it can directly build the movement’s power. How about the demand for a guaranteed income that poor and working class people could live on whether employed or not? Imagine being able to organize full-time because the state provided an income when capitalism can’t provide jobs. Currently, AIDS activists who are too sick to work are able to live on disability checks that were won by the demands of their own movement and others. This means they can organize for a few hours a week, fighting for more. Healthcare, freedom from prison, a home—we can see all these victories as territory that poor and working class people have won, like the mountains and farmlands that guerrilla fighters win in their battles against the state. Winning demands can win territory where people can organize, build, and bring in new people to the fight. From there, we get stronger and win more territory. Photo by Suzy Subways. Members of the Coalition to Abolish Death By Incarceration sing and shout out the names of their loved ones doing life in prison without parole, in a hallway of the state capitol building in Harrisburg last fall. Fortunately, these ground zeroes are the most powerful places to fight. Frances Fox Piven and Richard A. Cloward wrote in their groundbreaking book Poor People’s Movements about bureaucrats attempting to co-opt welfare recipients by encouraging them to lobby far-away politicians. “But welfare clients cannot easily go to the state or national capital, and when a few do, they are of course ignored,” Piven and Cloward wrote. “Sometimes, however, they can disrupt relief offices, and that is harder to ignore.” A crowd of angry poor women loudly occupying a welfare office can use their collective power to take control—although maybe just temporarily—of a space where the state routinely humiliates them. What will it take to get what we want? The Black Panther Party brilliantly revealed this with their 10-Point Program. Full employment, reparations, land, bread, housing, honest education, justice and peace—these could not be won without overthrowing capitalism and ending white supremacy. With every painful loss, and even when we win, we see how tiny our demands are compared to how much we all need to survive and live in dignity. Witnessing and experiencing the ways those in power ignore, ridicule and attempt to crush movements with violence is pretty intense. Anyone who participates in fights that can’t be won under the present systems can see that the state doesn’t serve the people—it’s just in the way. Oppressed people can only become revolutionaries when we stop thinking the current systems are legitimate and start believing we can actually change things. So to build for revolution, our day-to-day strategies have to delegitimize the state and build oppressed people’s belief in our collective power. As Amy Sonnie and James Tracy write in their book Hillbilly Nationalists, Urban Race Rebels, and Black Power, about the poor and working class organizers they interviewed, “These people proved, again and again, that revolutionaries are made, not born. And that organizing, when sustained, transforms both lives and conditions.” Reform demands, along with institutions of counter-power, can bring a revolutionary future into collective imagination if they’re part of a vision and strategy. Previous Base-Building: Activist Networking or Organizing the Unorganized?